Unique Moments Photography was privileged to be part of this wedding. After the pronouncement of Mr & Mrs Jones, everyone claps and congratulates the happy couple. Most of the time they stand and smile and walk down the isle trying to figure out where everyone is sitting. If we are lucky, they will look right at us and we can get the exit as Husband and wife with both of them smiling. This usually happens at every wedding. Sometimes we get surprised. 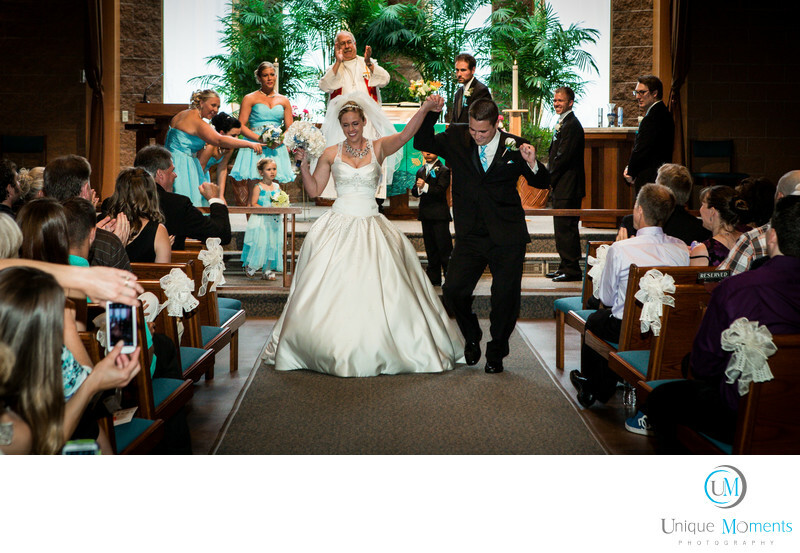 This couple decided to dance all the way out of the church. A fun moment to capture. We Titled it " The Dance". Everyone sat there and let them enjoy the moment and we were almost able to get the shot before all the arms with cell phones went into the Isle. One of our favorites from 2012. Location: 1001 North J Street Tacoma, WA 98403..